Over the last 20 years energy efficiency has started to have an impact. That is, people do more with the same amount of energy input. Looking at air travel (airplanes, Fig. 1) and cars (mileage, Fig. 2), between 1997 and 2016/2017 the mileage per passenger on an airplane or per car has increased by about 32% (while world population has only grown by about 25% over the same time period). 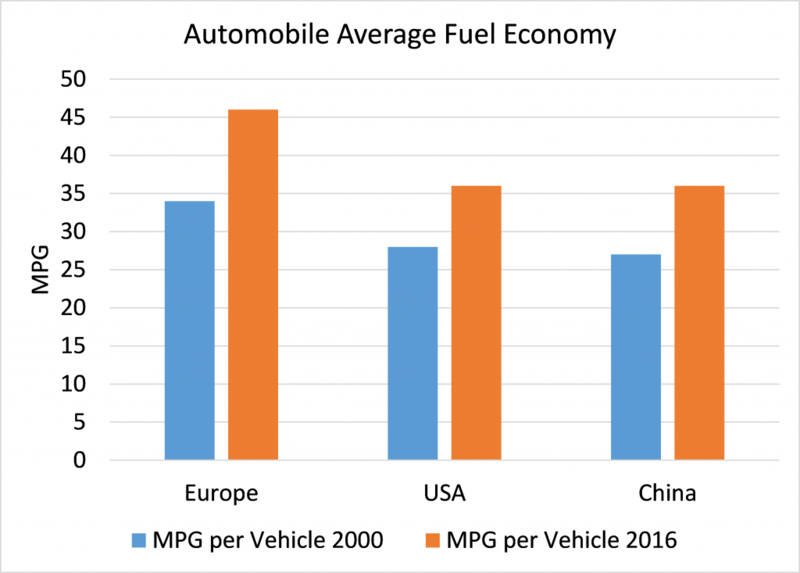 At some point, especially in the OECD states, demand for cars and fuel will decrease. Airline industry analysts project passenger demand growth year-over-year of about 3.5% for the next 20 years. 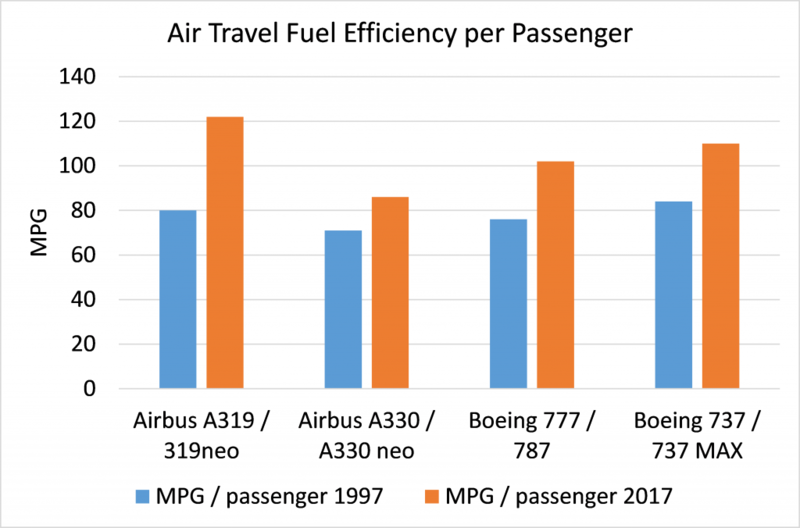 But as fuel costs are the largest expense for airlines, we can confidently assume that airlines and aerospace engineers will keep finding ways to fly farther with less fuel. We’ve only just started to see large scale buying of personnel EVs (InsideEVs.com), and personnel EVs are getting a lot of press (Reuters; FoxNews.com ). But it won’t be personnel EVs that will quickly kill oil demand; it will be the widespread adoption of EVs by fleet operators that will have a much more immediate and significant effect on oil demand. Fleet EVs such as trucks and buses are being adapted very rapidly, globally, because on a large vehicle, fleet basis, the total cost of ownership of EVs are already economically viable. Even when factoring in the higher initial purchase price for electric delivery trucks the running costs are so much lower for electric trucks (4 cents a mile) compared to diesel trucks (35 cents a mile) in an urban environment (Govtech.com) that the economics can’t be beat. 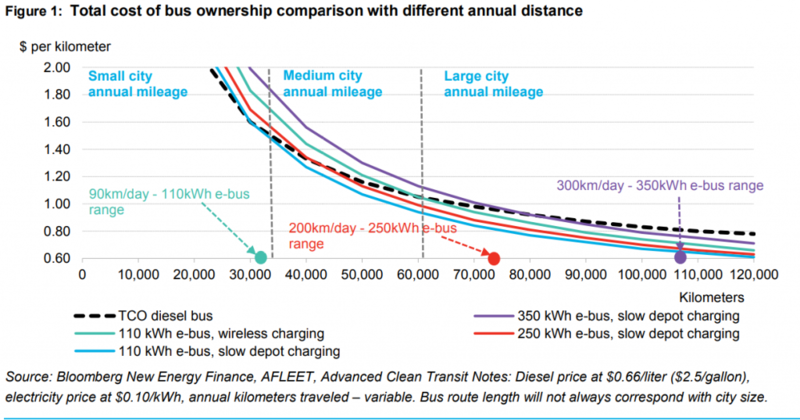 Electric transit buses (EBuses) are now more economical than diesel or CNG fueled buses in most urban applications (Fig 3). Electric transit buses will just keep getting more economical as battery pack prices fall and battery energy densities increase. Every 1,000 EBuses on the road displaces about 500 bbls of oil demand per day (Forbes). At last count there are over 300,000 EBuses on the road worldwide, with more planned every day, everywhere (GulfNews.com). To Fleet EVs I could also add other alternative fuels for fleet vehicles, with hydrogen gaining market penetration and a lot of interest, but a hydrogen discussion will need to wait for a future blog. I’ve also entirely skipped a discussion about the fuel changes to shipping and the advent of commercial scale electric airplanes. Again, for a later blog (if the readers are curious about that…). The second major technology shift coming soon to a nation near you is the reduction in the use of single use plastics and the switch from oil based plastics to bio-based feedstocks. After transportation fuel, oil companies are looking at stable demand for oil as a feedstock for petrochemical and plastic industries. That outlook is shortsighted. Projections of growth in oil demand led by petrochemicals are by no means a sure thing, Richard Chatterton, BNEF’s Head of Oil Demand, said in a report looking at the future of plastics and oil demand. Thinking a bit more about Houston, one of the world’s energy centers, things get a bit more ominous. We are in a world of easy oil and oversupply (see my prior blog), and there are a lot of changes that will erode oil demand steadily and significantly over the long term. So what could the major oil producing companies do to remain profitable and solvent? It is comparatively quick and easy to develop tight oil formations as opposed to expensive deepwater or frontier fields (IEA). The timeline for expensive, big projects is on the order of 10 years. For a tight oil field, 1 year. So it is probably financially safer for big oil companies to invest in the shorter term, tight oil projects (Forbes; Bloomberg) that yield quicker returns at lower cost than a big deepwater or frontier project that may eventually start producing in 10 years, just as oil demand is likely to begin to decline. With fewer large and expensive projects to develop, there will be less work for the supermajor engineering firms that grew to engineer, build and install big frontier and deepwater developments. Thus any changes to oil production investment by the big oil companies will have a compounding effect on Houston, Aberdeen, den Hague…. There is nothing pretty about watching an industry devour itself. P.S. By the way dear readers, especially you who are bankers, commodity traders and energy producers, this blog is free, whereas you pay consultants large sums for analysis and guidance on energy matters. I, on the other hand, will be happy to provide similar analysis and guidance for a mere pittance, lunch and perhaps a bottle of Glendronach “The Revival” 2016. I promise that my lunch presentation will be informative, enjoyable and as insightful as the high paid consultant reports. More bang for less bucks.